ICC World Cup India team players 2019 announcement live updates: Indian selectors will meet on 15 April in Mumbai to pick the squad for the showpiece event. Click here to find out at what time the announcement of India’s squad for ICC Cricket World Cup 2019 will be made. 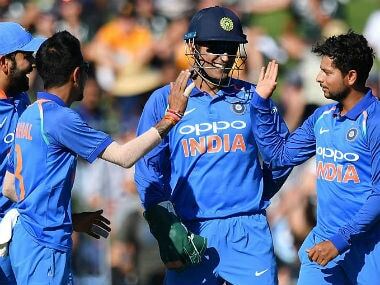 ICC World Cup India team players 2019 announcement preview: India’s 15-member squad for the ICC World Cup will be selected on April 15 in Mumbai. The last date for announcing the World Cup squads is 23 April but BCCI has decided to announce it eight days prior to the scheduled day. The World Cup will be starting on 30 May in United Kingdom. At the end of the ODI series against Australia, India captain Virat Kohli said that “just one spot” is up for grabs in the World Cup squad. Will Ambati Rayudu continue to be India’s No 4 choice or Vijay Shankar will get that spot? Will Ravindra Jadeja go to England in place of the fourth seamer? Will Rishabh Pant or Dinesh Karthik be included as second choice wicket-keeper? The selectors will be faced with many such questions when they sit to pick the squad. At least 11 players are certain to be picked into the squad: Virat Kohli (captain), Rohit Sharma (vice-captain), Shikhar Dhawan, Mahendra Singh Dhoni (wk), Kedar Jadhav, Hardik Pandya, Kuldeep Yadav, Yuzvendra Chahal, Jasprit Bumrah, Bhuvneshwar Kumar, Mohammed Shami. Rayudu remained the choice for No 4 for long but his recent lack of form could rule him out. In such a case, Vijay Shankar could get the spot. Another favourite for the No 4 spot is KL Rahul, who is back among runs, and could also end up as the middle-order choice. Another reason that makes Rahul’s case strong is his ability to play as back-up keeper. Rahul’ selection could also mean bad news for Karthik and Pant. Both the wicket-keeper batsmen have been plagued with inconsistency and that could go against them. Another possible headache for the selectors could be whether to settle for a third spinner in form of Ravindra Jadeja or the fourth pacer. The ability of Pandya and Shankar to pitch in as medium-pace bowler could go against the pacers.